In this work, biodegradable composite were prepared using banana pseudostem fibre and polyvinyl alcohol (PVA) matrix along with plasticizers and cross linkers in form of blended films of different compositions by solution casting process. The effect of composition on the structure and properties of the resulting films were investigated. OH groups on banana fibre and PVA formed hydrogen bonding interactions, which could improve the compatibility of the two components. With the increase of banana fibre weight percent, the degree of crystallinity of PVA component decreased. The tensile strength and elongation at break decreased with increasing content of banana fibre. However, at 20% banana fibre content, the flexibility of the blend films was still high, with the elongation at break more than 100% and tensile strength of 30.8 MPa, which was near to the commonly used LDPE package films. Composite films were permeable to water, but at the same time able to maintain consistency and composition upon drying. 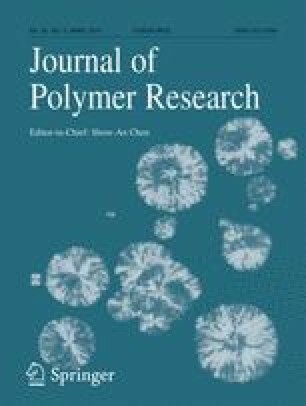 Chemical crosslinking by citric acid and glutaraldehyde, between banana pseudostem fibre and PVA, all of which are hydroxyl functionalized, improved water resistance in films. Composite films with alkali treated banana pseudostem fibres had maximum tensile strength of 34.2 MPa and least water uptake of 60% only.